Forum Index > Historical Arms Talk > Shields - What do you prefer? Do you have a favourite? Firstly, I'll say I agree with Elling as far as modern dueling goes. My friends and I don't have armor to use when we fight (well, I have some, but none of my friends do!) We fight with wooden swords and pvc/duct tape spears and any types of shields I make from plywood blanks. It's hard fighting, but we have our rules. No shots below the knees or elbows are counted, and no shots on or above the neck are counted. The round Anglo-Saxon/Viking age shield is another favorite of mine. Another awesome looking set. I'm pretty sure that must be your Mercenary Tailor's shield with some touch up painting, 'eh? And is the helmet your Medieval Reproduction's piece? Looks sharp, sir! Could you tell me where you put your stuff when you're photographing them. My site's down right now, and when I put it back up, I want myArmoury.com or Albion.com quality pictures! Not many people take photos like your two sites. Could you PM me with some details about how you do yours, or any other way you see them done to get the high resolution, etc..? I only have a digital camera, but it takes sharp pictures if I place the items I'm snapping sharply! I'd go with a steel "rundel" aka "rondach aka "target" though I'm not sure wether the shoot proof version is worth the added weight or not. In the pre-firearms period the curved large shield which evovled out of the kite shiled in the 12th and early 13th centuries woudl be hard to beat for sheer protection. The only shield I can think of with better coverage is the heavy pavises the French experimented with against English archers during the 14th Century. As a further comment, a very nice picture where Elling shows how a shield-man SHOULD be killed. He tripped and fell all by himself. Honest. Also note how Elling is being axed from behind by a 5'3" tall girl as he does this. Although I have developed a distinct aversion to using a shield on horseback (I hate how it interferes with my rein control, plus it's hard to regain the reins when you loose/drop them, etc.) I have LOTS of respect for those who are competent at it(and neck rein. Too many jousters I've seen try to use sheild and lance and plow-rein with a rein in each hand, which is ridiculous.) But if I had to use one in that situation, I think the kite is the way to go. Pic of myself and friend Henrik playing at being Normans last year below. On the other hand, for serious combat, I rather like the steel target. I know, very 16th/17th Century, but then that's my period, and the targets are quite serviceable! What, no votes for the Roman scutum, yet? It's like having a small house between you and your opponent! And it just begs you to smash it into their face and gut them like fish. What could be more fun? Taking the head and arms away as target in combat with shields is like taking away the head and body as targets in boxing. Historical shield use requires that the bits not covered by the shield (primarily sword arm and head - legs are, as in every combat system, protected by distance) are target and that the shield be able to be used offensively. My new paper on historical large shield use is out in Spada II. Amongst other topics it covers different shield shapes and their effect on the fight. Because, in the light contact, no helmet hits system that we use for skirmish fighting, there are very few ways to get past a kite and deliver a "realistic" blow. Fighting with there shields would as far as I can see call for a very direct and brutal style, almost like later plate armour fighting; Get in close, push your opponent of balance, pommel him in the face kind of stuff. Safety concerns have so far kept us from trying to do "propper" fighting with the kites, but the expanded dueling style, with helmet hits, could make kite fighting more interesting, of course. So it's mainly problem with our rules set. But still fighting with shields is less challenging than fighting with bucklers, and making "good" hits is easier because you don't have crawl around a big shield. Thanks. I assumed you were refering to it's use in mock-combat but wanted to be sure. Thanks Gregory. I don't want to take this thread off into left field with talk of photography so I PM'd you with some information. Hi Gordon, the problem with the way 'most' jousters and riders use a shield on horseback has to do with the fact that they hold it out from the body. This is a modern conceit born of the fact that they have to 'present' the shield. The correct way to use a shield on horseback, whether it is a kite or heater, is to hang it off a guige and have it sitting against your left side. It effectively becomes a large piece of armour. You can slip the enarmes on so as to allow some small movement of the shield. In a melee situation on foot I like to slip the guige off and my arm through the enarmes. I remember about 14 years ago when I first started re-enactment, I was faced by a spearman, he thrust and I stepped out to my left, parried the spear with my sword and bought my shield around in a flat arc striking him in the ribs with the top edge, this dropped him straight to the ground. I was pulled up very quickly and told that you cannot use a shield like that. I though it was a waste of a wondeful weapon to just use the shield as a defensive item in foot combat. Nice to see that the work Stephen Hand is doing shows that a shield could be used as a weapon. Of course on a horse you don't want to be flailing a shield around. The guige was used to handle full height shields in a similar way by the Mykenaians. The two shields on the left in the attached image show the guige slung around the neck and both hands are on the spear. 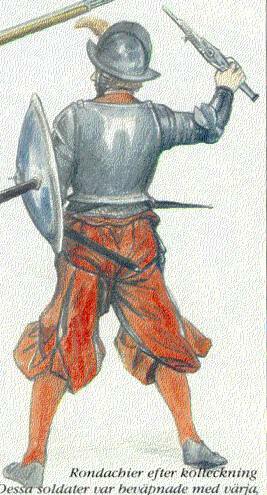 The guige hangs against the side and acts as a large piece of armour similar to how the Norman kite shield was used on horseback. Here is my Iberian shield that I just finished. Thought that I would give this strapping set-up a try, but I haven't figured out how to work well yet. Sometimes there are depictions showing them with a spear held behind the shield, and it does help some. Need more and better pictures of my other shields, but here is what I have for my la tene and viking age shields. I'm not sure on the thickness of any of the convex anglo saxon shields, but many of the flat ones are in the area of 1/4". One of the things that I found was just a thin fabric glued to the front will cause it to dome up a good bit as it dries. I wanted to try a leather or rawhide front to one of these to see if I couldn't get about the same degree of curve, but it has been about four years and I still haven't got around to it yet. One of my concerns after the la tene shield though is if it could withstand that much curvature being put on it from the rawhide. My first la tene pretty much self destructed when I added a heavy rawhide face and back to it. My rawhide was probably at least 3/16" thick and it put several inches of bow into the shield and it was made from two layers (crossed grained) of 1/4" wood. It popped and cracked for a couple days as the rawhide dried, when I took it apart it had broken and cracked several of the boards. Who knows though, a single 1/4" layer might be flexible enough to withstand it though. 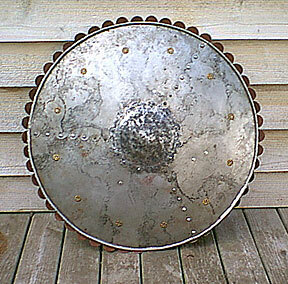 My favorite still is my viking age shield though, good amount of protection and still plenty of movement possible. I like Nate's British horned shield, so that might be the next type I make. Hey Rod! Yeah, it's too weird the way the whole modern jousting conciets (well put, by the way) have had their effect. I know that at the Sonora Joust one of the problems was on rider not "properly presenting" his sheild so that it could be hit akin to either an ecranche' or a grandguard, but heck, in battle having the other guys lance glance off of your sheild was the proper way to do it! Ah well, sports, eh? And I agree, using a guige would be the only way to ride with a shield (I almost said "fly", but actually I would prefer not to!) but sadly (see above ) our modern conceits prevent just letting it hang down. Personally I want the reins in my hand, rather than the grip of some board. As it were. Of course, that's what plate armour is for! I guess one has to separate in one's mind recreating the true martial art and practising a SAFE sport: On the one hand the sports techniques are teaching you bad habits that would have gotten you killed historically and on the other using the REAL fighting techniques would get you or someone else killed TODAY. With jousting maybe the proper use of the shield could be used if one compromises by using a safe spear substitute that could be aimed in earnest: Lethal if a sturdy spear was used, the aim would be true, the impact artificially very weak. The point would be to train realistically as to target but compromise as to effect. With real lances the current safety measures would be used were aim and use of shield is altered for safety reasons but full power would be used. 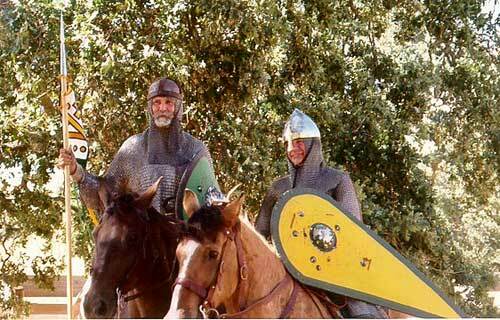 Since I don't joust or even ride, you can tell me if this suggestion would have practical applications. I imagine that you are quite right, for either foot or mounted combat. 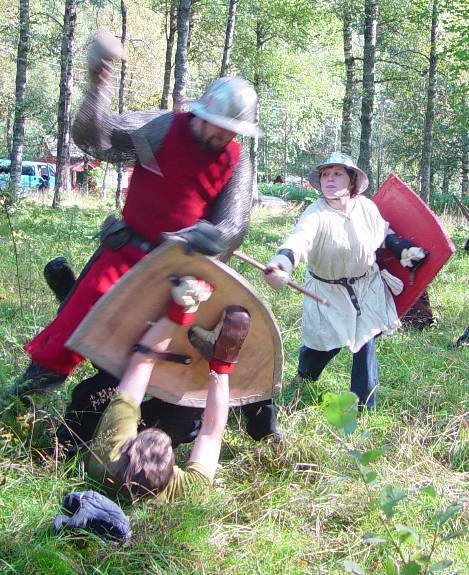 As Rod mentioned above, smacking someone in the ribs with the edge of your sheild is quite apropos for combat: for our reenactment, when folks have to go to work Monday morning, it's a bit much, LOL! One of the main differences in jousting (either modern or Renaissance) compared to combat is that we (almost) always use a tilt (the fence which makes lanes for the horses to run down) to keep the competitors heading in a left-to-left manner. This produces greater stresses on the lance, rather than on the target, leading to broken lances rather than broken ribs, LOL! The proper "combat" method is to run "at large" at your enemy, right-side to right-side (as did the so-called "Italian Joust") where in you are getting a much straighter angle of impact, allowing much more of the power of the lance to be imparted into the target area with less stress to the lance. Properly done, unhorsings usually result, as I am informed. Improperly done, nasty horse wrecks are the result, sending competitors to the hospital and horses to the knackers, so virtually all jousting associations ban this practice, and only an idiot would do it. Ugly any way you look at it. Anyway, Rod and Lloyd are MUCH more well equipped to discuss these issues, since I'm mostly an armchair historian on these details, only having just begun to get serious about jousting! Hopefully they'll chime in on this! HMMMMMM: Right side to right side the shield would be on the wrong side to do much good except just hanging there to protect your shield side from others attacking you from that angle. In the confusion of a complicated melee the shield isn't there only to protect you against the person you are charging at who is also charging you. I expect when the opportunity presented itself you would also charge at an opponent from any advantageous angle: 90 degrees on shield side or lance side of your target ??? After a headlong charge there would be a lot of manoeuvring to get a better angle than simply going trait at each other again. During the initial contact you attack left to left, this means you are protected by your shield. When going to hand weapons you try to manouver so that you present your shield side to your opponent whilst attacking their unprotected side or back. You cannot manouver a shield over a horses neck with any degree of success whilst trying to control said horse, defend from the attack and attack yourself. Cavalry melees are like fighter plane 'dogfights'. Constantly zigging and zagging to gain an advantage. I have been in a lot of them with mulitiple opponents and the guy who can control his weapons and horse the best is the guy who will win. I like your shield William. Thank you. Your gear also looks terrific. Very nice. I like the fact you have bucked the trend and gone with proto heraldic colour on your helmet - most of us get caught up in the bright and shiny steel look, forgetting that so much period iconography shows the importance of colour on armour (at least for the milites). Some good looking shields in this thread too. I also have a soft spot for large oval Celtic body shields and even Roman scuta (there you go Matthew). May God have mercy on my enemies, for I shall have none. Hello. I'm a SCA heavy combat fighter, I'm also six and a half feet tall with realy long legs that used to get hit alot. I say used to because I recently started useing a square shield(24"x26"). Befor that I use a heater which didn't cover my left leg at all. When you first look at one the point of the heater looks like it would do the trick but when held, the point is pointing out away from you leaving a gap. Befor the heater I was useing a kite. I hate it. The long point leaves no space for my left leg to travel when I move. The only way to avoid it is to hold the shild to my left side leaving my front open. The square shield, when held diaganaly, covers from knee to my cheek. I can go from straght to diaganal in a split second and I'm better able to block incomeing shots then I was with the heater. I don't know how historical it is, but damb it works. I'll post some pics of the thing if I can ever get the computer to upload them. I'd say it's a tie for me between the heater/kite and the round shield. I can get in some really good 'punches' with the edge of the round shield, but the heater provides more cover for the lower parts.